You’ll never forget a birthday again! Why ruin a perfectly good relationship just because you forgot? 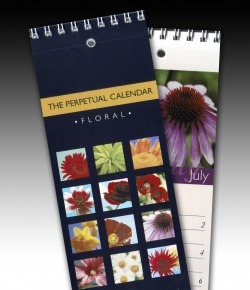 The perpetual calendar tracks all annual events that are important to you. It’s like a calendar but can be used year after year because only the date is listed, not the days. Each page allows easy viewing of a whole month at a glance. Simply write the name or event against the date, then hang it where it is visible – by the phone, computer, or in the toilet – and never forget that important birthday or anniversary again. Designed in two styles by Mary Lou Howie – Zodiac or Floral, with flower images by graphic designer Lin Tobias, La Bella Designs, Melbourne.